Keeping young children occupied can be a difficult task regardless of the situation, but during a wedding this can prove almost impossible. A quick fix? It's probably in your pocket. Have some emergency toddler videos on hand, the wedding day might run more smoothly because of it! 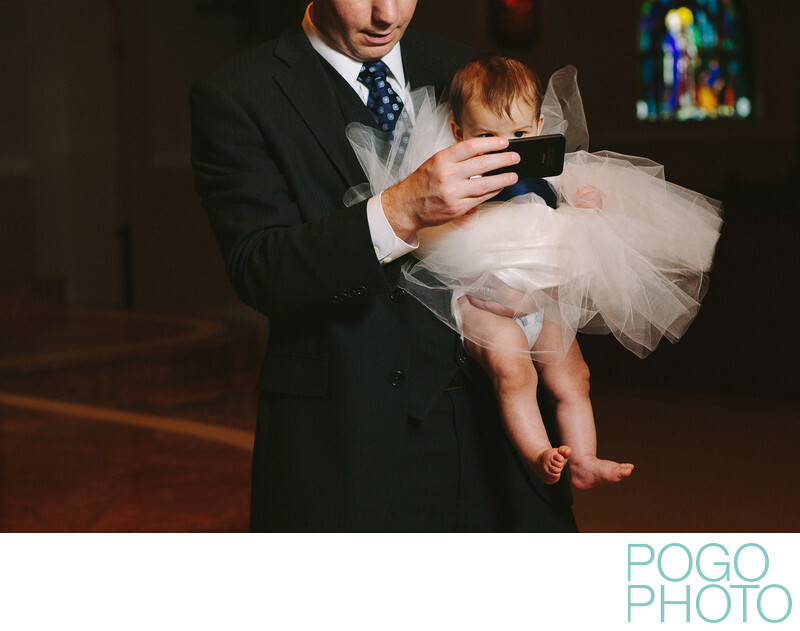 This moment was captured during family formals in the church in Boca Raton, florida, immediately before this young father and his daughter were to be added to the group portrait. Compositionally the leading lines from the young father’s shoulders and tie down through the baby’s straight legs draw the viewer's eye downward, while the fluffy pink tutu of her flower girl’s dress and the stained glass window far in the background provide context clues as to the situation at hand. The anonymous feeling of cutting the dad’s face just below the eyes implies that there’s something improper about the situation, and the intent gaze of the baby with her excitedly curved toes and pointed feet brings a smile to the viewer’s mind, though we can’t see what her facial expression actually looks like. Images that have mystery, dark humor, or plain quirkiness tickle us in just the right way, and if you’re lucky we might find a moment such as this one at your wedding. 1/200; f/5.0; ISO 800; 85.0 mm.